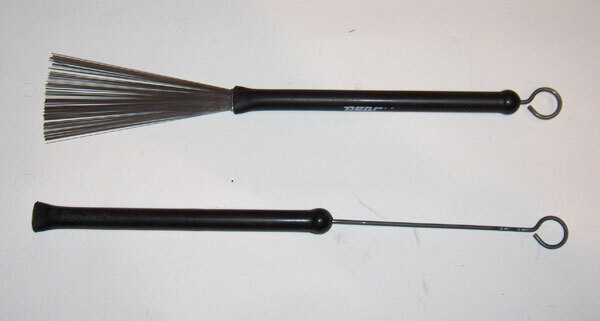 : : click to enlarge : : Appeared in the 1920 with the play in cabaret, the brushes ("jazz brushes" or "drum brushes"), less loud than sticks are now with steel strands ("wire" or "bristles") retractable ("telescopic") in a handle made of rubber or plastic and an aluminum sheath (first with a simple wood handle). You can find them also recently with nylons strands, stronger but less sounding and brushes with wood strands ("rods", which you can not use for sweeping). The interest of the brushes is especially the specific use of sweep on the skin (or "drum head"), thanks to its "grain" (with "sprayed coating", all plastic skin did not have it). The drawings/animations (to activate a brush animation, hover the mouse over the figure you want to see to become animated) offer various quite common and basic forms ("figures", "moves", "motions") of sweeping (but there is in fact no limit, which brings this technique close to the practice of painting). L: Left Hand (X = place of a normal stroke; thick line: accent in friction (by pressure or/and higher speed); with two brushes, the arrows indicate the place of the hands at the same time). Note: All figures can be reversed symmetrically for changing hands. Figures with one hand allows to play with the other anywhere and anyhow (with a cross stick with a normal wooden drumstick, for example, common in jazz-samba drumset style). The first figure (small arc of circle with centre on wrist) is a very natural move, using the rotation of wrist, very useful for quick binary rhythms like in samba (imitating the "ganza" (Brazilian shaker) with a continuous flow of 16th notes). You can imitate a single stroke roll with it (thanks to the back and forth move). You can also accent an end of the arc, playing the syncopated rhythm that you want (example: bossa nova) or just quarter notes. You can double the speed with both hands alternating the accents. The second figure (large arc of circle with center same as the drum head) is more sophisticated and accents very strongly the back and forth movement (ideal for beating medium tempos). The third figure (circles) is essential to keep a continuous non-rhythmical flow (like a ride cymbal resonating, often used in jazz), specific to brush technique. The smooth accent (not necessary) is given by acceleration or more pressure (ideal for slow tempos because of a longer distance of the move, but you can give accents anywhere on this circle). The fourth figure (eight) is interesting to give also a non rhythmical background sound without an accent and change the direction of rotation without leaving the skin. It's a very long figure, ideal for very slow tempos (if you give only one accent by figure). The fifth figure allows playing the right hand twice faster than the left (interesting to shuffle the chabada with the left hand). It gives the sensation that one hand "chases" the other alternately (for longer moves with two hands sweeping). 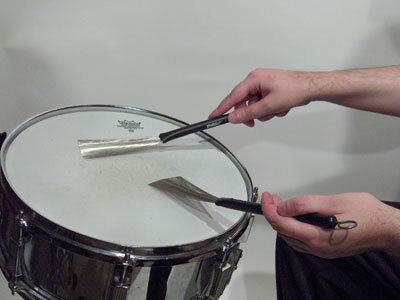 The sixth figure requires to left brush strands to pass on those of right brush ("rubbing", which can imitate a shuffle) or straight to lift the right brush for crossing (which allows to create a more brutal accent by replacing or taking off the brush). The seventh and eighth figures are linked and we generally play a "chabada" (jazz ride cymbal rhythm) with right hand (with shuffle (double stroke on 1 and 3) on top and off-beat (single note on 2 and 4) on bottom, or reversed). Note that I think that it's more powerful and comfortable to play the typical strong syncopation of jazz in unison with the hi-hat with foot ("chick") near yourself. Figure 9 is a combination of several sweeps (in arc forms) with wrist and full rotation of the whole arm. Figure 10 is very classic in jazz (used by André Ceccarelli for example). You can also play top and bottom strokes with the right hand (like in figure 7 and 8) going over the left brush which can then play a wider circle (used by Bertrand Renaudin for example). The eleventh figure works on tone variation induced by going towards or away from the snare rim. I've seen it in a video of the great Max Roach. The twelfth figure is played by making vertical circles ("whirlings") a segment of the circle in the air, the other sweeping, both hands alternately (like a single stroke roll). I was inspired by Daniel Humair for this one, after a master class he gave at the National Conservatory of Music of Paris. He pointed out also that the brush stroke in general can occur with sweep, as here, but also by lifting briefly the brush from the skin, and brutally replace it while continuing the basic movement (as described here) to integrate a second voice and variations (improvised or not, elsewhere). By hitting the skin in a diagonal direction with the brush instead than a vertical, you can get a more typical "smooth" (sweet) sound, very pleasant for the ears (and I'm fully agreed with him like a lot of jazz drummers) and hit with back and forth movements (faster). The thirteenth figure is a sweep with crescendo, and brutal stopping ("whipping motion") and lifting of the brush at the end to come back to the beginning (vertical "drop" form). I saw this stroke performed by Dave Weckl on his pedagogical video: "Back to Basics", DCI music video, 1988 (a must in matter of instructional drum video). The fourteenth figure is played by Jack de Johnette in slow tempo, to keep still a good sound power, by ambidexterity and lengthening the movement, which allows to keep a good sweep speed (not easy for the coordination). The last figure (15) is also a technique used by Jack de Johnette to make a chabada in fast tempo. The idea is to make a vertical semicircle, back and forth, with the left hand, on the downbeats (1 and 3), on the model of Figure 12 strokes, and to insert double strokes in syncopation, with the right hand (more quick and easy than triple stroke, and easier for a swing shuffle (shuffle with both hands here)). The last two figures were seen on the instructional video of Jack De Johnette: "Musical Expression on the Drum Set" Homespun Video, 1992 (100 minutes) which I also recommend highly. Otherwise, the brushes allow playing obviously all normal stick strokes, even rebounds, if you master this technique (steel or nylon is very "elastic"). You can of course also vary the rhythms (accents, starting and speed of motions, normal strokes, places, sizes of figures, etc.) at will. It's just up to your imagination! 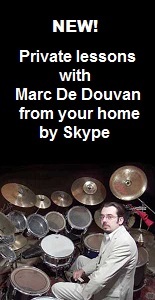 Marc De Douvan, December 2005, augmented and translated in december 2012.